A sunny break on a wet afternoon so a walk up to Chirton Maggot was in order. From the A342 the track is wide and well elevated above the surrounding fields. It eventually enters quite a deep cutting as it makes its gentle way up to the top of the Plain. There is no unexpected awkward steep bits or other problems to spoil my theory. As the most direct route from Marden to Redhorn Hill it seems the most likely route for the Sarsens on their way to Stonehenge. Is this a carving of a Breton Goddess. Atkinson wrote about this carving at length. 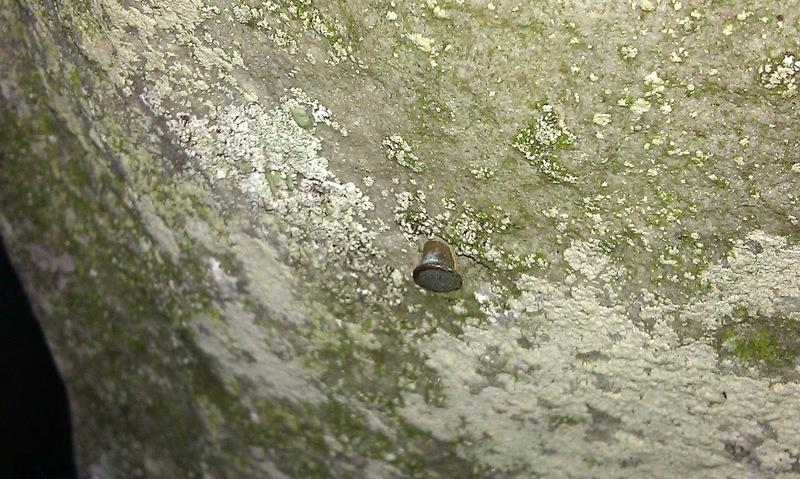 A spiral spotted by Simon Banton - Meaning? Age? 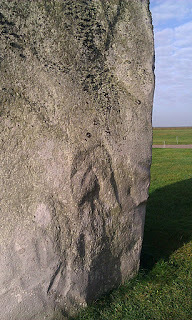 OK so there is no shortage of Stonehenge pictures but here are a few oddities. Peck marks in the South Station Stone showing aborted attempt to cut chunk off it, very similar to the well known marks on the slaughter stone. A quick comparison of the route profiles for the Atkinson and Marden Henge routes across the Pewsey Vale. Atkinson's route begins where it turns off the A361 above Bishop's Cannings, the Marden Henge Route on the top of Walker's Hill. Both end at the top of Redhorn Hill. 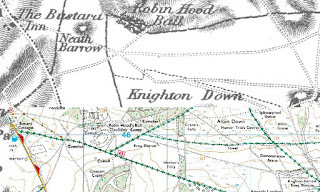 The blip in Atkinson's route in the middle is where it crosses Coate Hill. 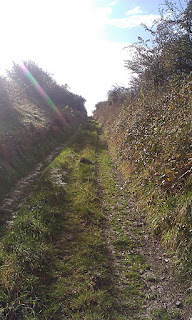 The steepest ascent on Atkinson's route involves rising 40m in 300m whereas the Marden Henge route's steepest rise is 75m in 1000m going up Chirton Maggot, a much gentler climb. 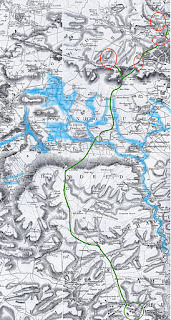 The accepted route of the sarsens is based on Atkinson's 1956 Sarsen Route From His Book "Stonehenge"
I think research has shown that that route is not the most likely and a route through Marden Henge is more probable. 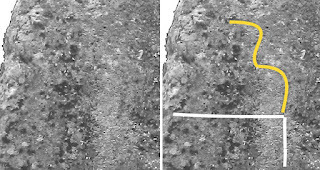 The extent of Cannings Marsh is one of the key features. Other factors are explored elsewhere on this blog. This is the latest revision of the route which fits the geography best. 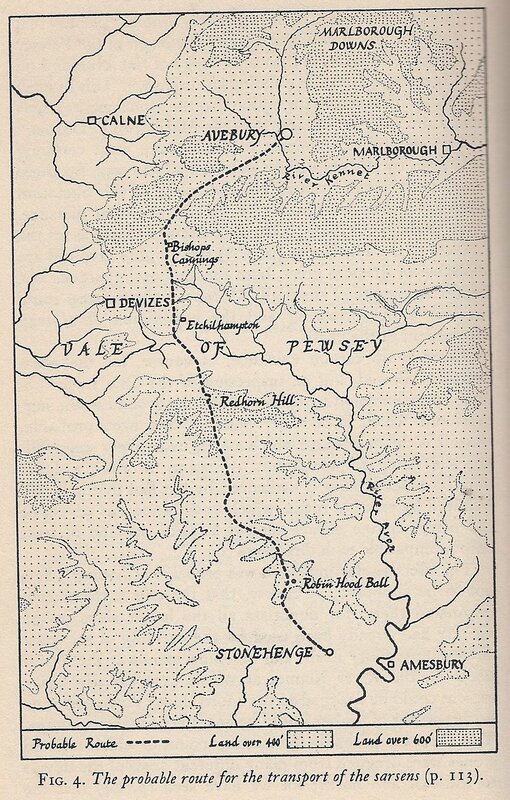 Atkinson's 1956 Sarsen Route From His Book "Stonehenge"
It is now generally agreed by archaeologists and geologists that the origin of the Stonehenge sarsens must lie on the Marlborough Downs, in the area where sarsen blocks still litter the surface in many places today. 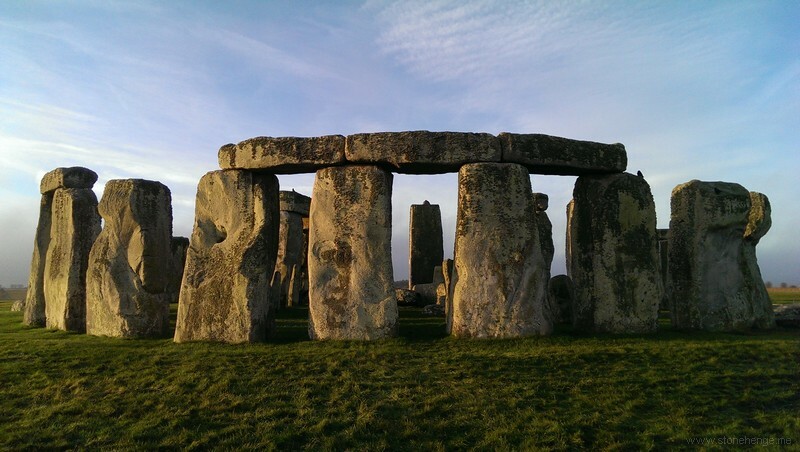 In the past it has been suggested that the stones came from some other and smaller deposit of sarsen on Salisbury Plain, much closer to Stonehenge, which has since been entirely worked out. There is no evidence to support this. 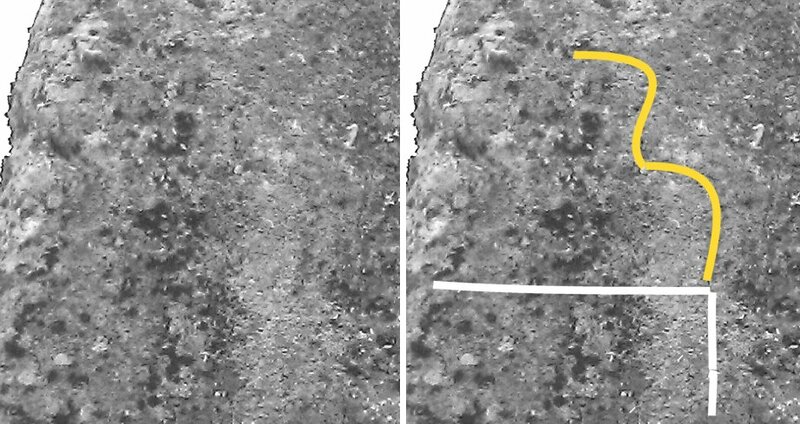 It is inconceivable that this hypothetical deposit should have consisted entirely of blocks of just the right size and number for the building of Stone henge, for even in the thick concentrations of boulders near Avebury examples comparable in size with even the smaller uprights at Stonehenge are very rare. Had this deposit existed, it must have contained many smaller boulders suit able for modern building, and some of these at least would now be incorporated in the houses and barns of the neighbouring villages. In fact, it is only around Avebury that sarsen is used for building at all. In the villages of the Pewsey Vale, east of Devizes, in the upper valley of the Avon and on the Plain itself, sarsen in buildings is unknown. This in itself is sufficient to disprove the notion that the Stonehenge sarsens came from anywhere nearer than the Marlborough Downs. 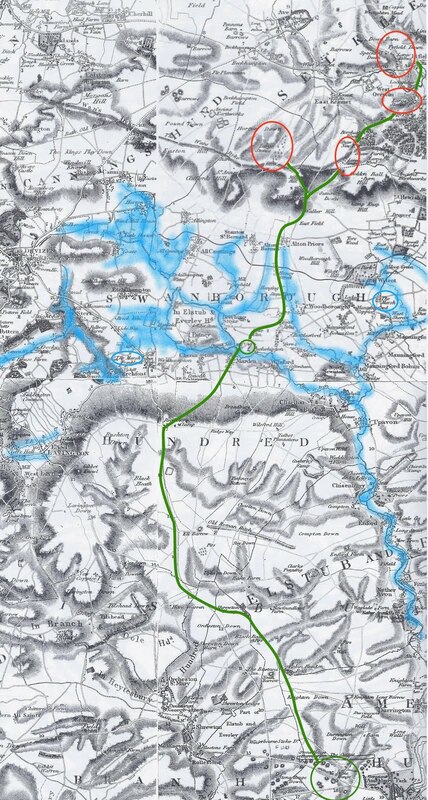 The method of transport to Stonehenge must certainly have been by sledge-hauling overland all the way, for there is no possible water route. 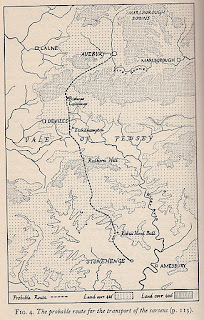 The difficulties of this operation must have been enormous, for though the total distance, about twenty-four miles, is almost exactly the same as for the haulage of the bluestones the weights involved are about seven times as great, both for the heaviest stones and for the aggregate of them all. Moreover, the shortest route involves a river crossing and the negotiation of a steep escarpment of the chalk. There is no certain evidence, of course, for the route actually followed, but an inspection of the One Inch O.S. 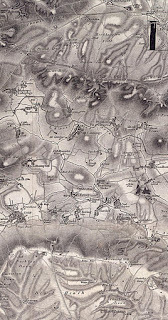 Map, supplemented by field-work on the ground itself, sug gests one which is certainly possible, and even probable, since it is the only route which avoids excessively steep fall ing and rising slopes without deviating far from a direct line. Its practicability is evidenced by the fact that it is still followed by existing roads, which until the recent advent of the petrol engine always tended to take the line of least effort compatible with directness. 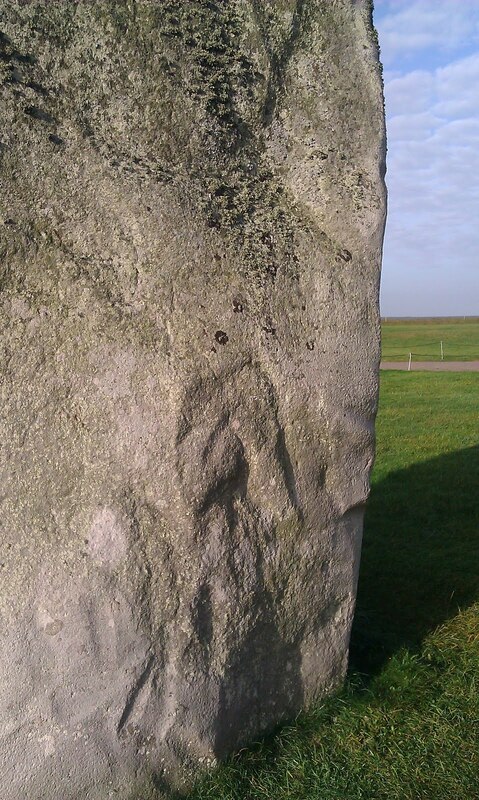 The effective starting-point was probably at Avebury. It is not to be supposed, of course, that the stones themselves originated there, for doubtless all the larger slabs in the vicinity had already been used for the building of the great circles at Avebury itself. But Avebury stands at the lowest point on the River Kennet at which exceptionally heavy sarsens could be dragged across a ford; lower down elaborate bridge-works of timber would be necessary for their passage. This then was probably the starting-point, to which selected stones were dragged from many different areas of the downs to the east and north; for we have seen that the builders of Stonehenge were hard put to it to find sufficient stones of the right size, and it is out of the question that all of them lay ready to hand in a single valley of the downs. It is tempting, too, to think that Avebury may have served as the starting-point for other than purely practical reasons. Here, after all, was the greatest and doubtless the most renowned and revered sanctuary then existing. What could be more fitting than that the stones of the new monu ment, which was to eclipse it 'as St. Pauls doth a parish church', should ceremonially be dragged through its already ancient circles, so that their bearers could receive from the presiding arch-priest that spiritual benison and encourage ment of which their forthcoming physical exertions were soon to leave them so sorely in need? From the fording of the Kennet just west of Avebury the route follows the line of the modern road through Beck hampton towards Devizes (A.361), a notably straight and level stretch which is an open invitation to the modern motorist (frequently and disastrously accepted) to overtax his engine. 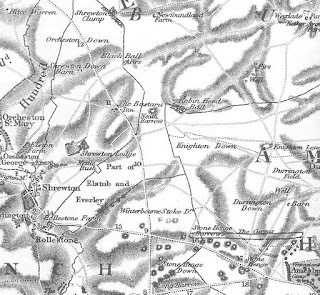 About a mile south-west of Shepherds Shore, where the road crosses the Wansdyke, a minor road leads south wards to Bishops Cannings and thence to Coate and Etchilhampton, falling and rising gently but avoiding the marshier bottom of the Vale of Pewsey. It is only by this route that one can avoid a difficult crossing of the northern escarpment of chalk that marks the edge of the Vale, which elsewhere is exceedingly steep. It need hardly be said that the difficulties maneuvering a fifty-ton stone down a slope of say, 1 in 4 are not less than those of hauling it up; in either case, such slopes were to be avoided. The route thus described as far as Etchilhampton leads to narrowest crossing of the Vale of Pewsey itself, now marked by a portion of the modern road A.342, which itself perpetuates a much earlier trackway known as the Lydeway. 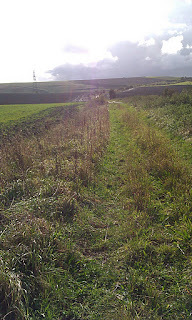 running for two miles across the bottom of the Vale, significantly enough on the only line athwart the Vale which involves no crossing of a stream, the Lydeway reaches higher and firmer ground at Foxley Corner. 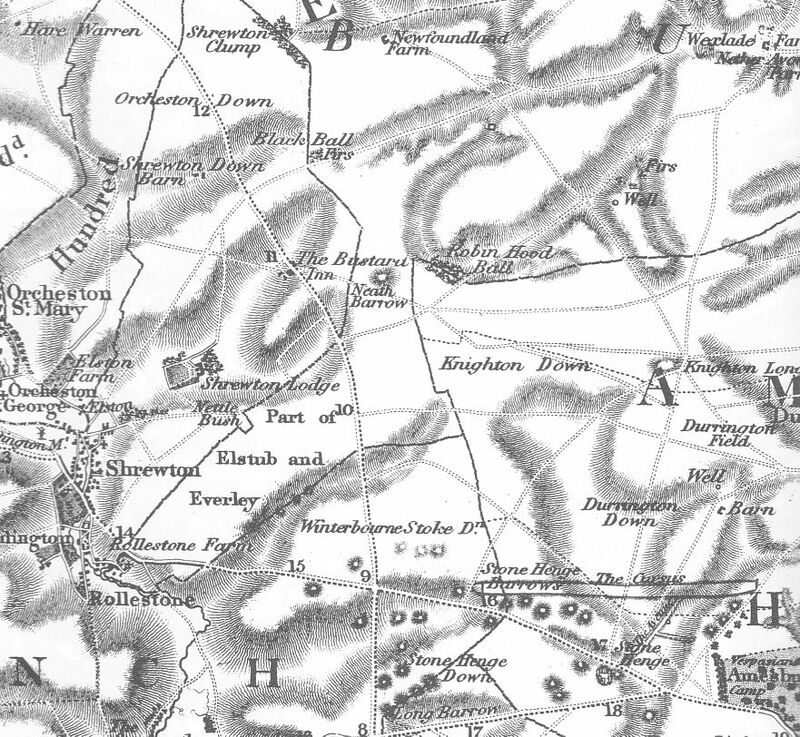 From there the route follows approximately the line of the old Devizes-Salisbury road, now virtually closed to the public by the establishment of artillery ranges along its course. This road runs within two miles to the west of Stonehenge, and for the greater part of its course keeps to the natural ridgeway with the minimum of rise and fall. 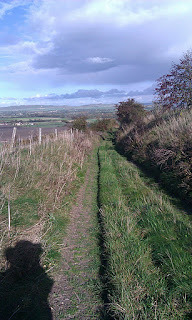 The only difficult point is where it climbs the steep southern escarpment of the Pewsey Vale at Redhorn Hill. 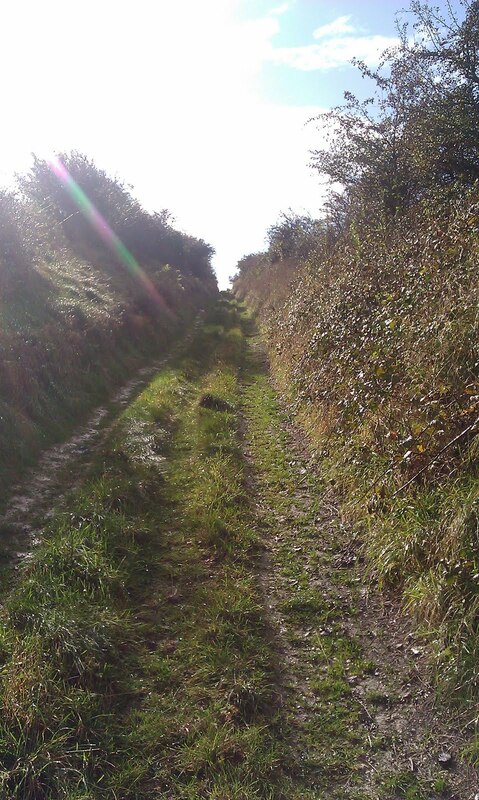 Here the road makes a dog-leg kink to ease the climb, and doubtless the builders of Stonehenge did the same. 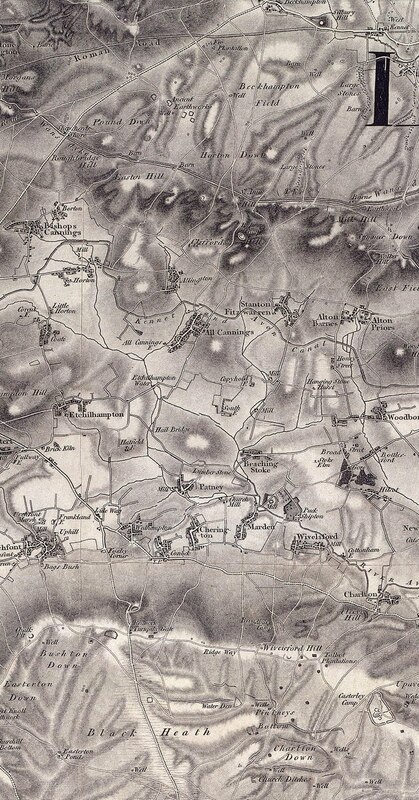 Indeed, they had no alternative, for the escarp ment is equally steep for nearly four miles to east and west, and to make a detour to find a gentler slope would be to sacrifice the advantages of the subsequent easier going on the ridgeway.